David Helt says there is a clear difference between the “old” and “new” ways lawn care operators (LCOs) can manage their fertilizer applications. When considering this theory, it seems clear that LCOs should prefer the method that can improve turf quality in fewer visits and at a lower cost. But industry experts agree that this approach is not the most common. Many LCOs continue to use the old way, regardless of advancements in fertilizer technology that can save them time, money and labor. Fertilizer technology has come a long way in the past several years. Manufacturers have developed polymer-coated controlled-release products that break down slowly and feed the turf as needed. With some controlled-release products, as much as 95 percent of the fertilizer can be used by the turf, compared to traditional fertilizers that release the majority of their nutrients so quickly that they wash away or vaporize into the atmosphere before they can be fully absorbed, says Bob Hartman, director of sales and marketing for Knox Fertilizer Co., a specialty plant food manufacturer in Knox, Ind. These new products are effective for three to four months or longer, eliminating the need for the regular four- to six-week visit. New combination products that include insect control, weed control and fertilizer in one application also reduce the need for frequent visits to the same property. So why are LCOs hesitant to use these new fertilizers and change their application methods? Industry experts say there are several reasons. One is simply that change is difficult. Hartman says many LCOs view their current practices as an efficient way of doing things and don’t realize the benefits they could gain from switching things up. Additionally, customers, particularly residential homeowners, want to know their lawn care provider was on their property before they will pay the bill. Some LCOs can’t wrap their heads around the idea of billing their customers for a season’s worth of work while making fewer visits to the property—even if the turf ends up looking as good as or even better than before. Another challenge is the higher price of controlled-release fertilizers. While LCOs may be able to specify the amount of controlled-release nitrogen in their fertilizer to help control the cost, Hartman says these products cost approximately 30 percent more than their traditional counterparts. The price difference can be a tough pill for LCOs to swallow. But paying for a higher-quality product upfront can save money in the long run, Miltner says. Making fewer visits to each property saves money on labor and fuel, and making fewer fertilizer applications decreases wear and tear on equipment, so spreaders last longer. Miltner says new truck regulations and rising freight costs are growing problems facing the industry, and using less product can decrease a company’s freight and shipping expenses. While some of these savings aren’t initially obvious, Miltner says they add up over time to make a big difference. Helt says LCOs can utilize the time they used to spend fertilizing to provide profitable add-on services. Tree care, pruning, pest control, bed maintenance, mulching and targeted weed control are all services that LCOs can upsell to their existing customer base and provide during the four- to six-week visits that were previously reserved for fertilizer applications. For LCOs interested in approaching their fertilizer applications the new way, Miltner suggests starting with a handful of commercial clients who typically are more concerned with having green, weed-free turf than they are with how many times an LCO visits the property. 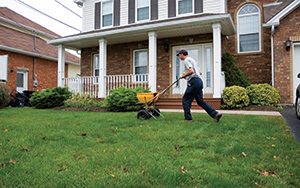 Full-service landscape companies also can try this fertilization approach, since they are on clients’ properties to provide many services at different times throughout the year. Education—for both the LCO and the customer—is another important piece of the puzzle to ensure everyone is on the same page.